I have noticed that as soon as men get out of the East, all of a sudden they become experts on running an organization and on riutal, when in fact just the previous year they struggled with these things, as well as with cantankerous past masters who wanted to show their expertise. Let’s be honest here and now. Your year as Worshipful Master was probably not better; it was just different, and it was yours, and thus will always have a special meaning to you. Your ritual was probably not better. You had all the same screw-ups, misunderstandings, and momentary lapses of memory, all while trying not to disappoint the cadre of past masters looking at you disapprovingly. Your year was not better. Your ritual proficiency was not better. Learn the ritual spot-on. I had the benefit of conferring degrees starting when I was a junior warden, so I had plenty of practice when I got to the East. I was also training to become the district ritual instructor, and was learning from the best. Note – this does not mean I was perfect at it, but I was better than I would have been otherwise. Learn the Masonic law and know it cold. At least be able to look things up. The Grand Lodge of Virginia has a whole correspondence course on our state’s Masonic law. 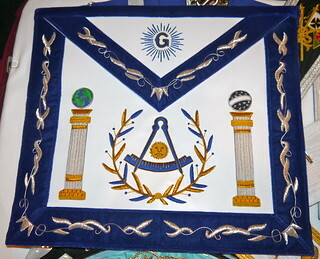 Ask your lodge secretary if your grand jurisdiction has something similar. Study the law and learn it so that you are pretty well versed and can discuss it with some level of proficiency. When you are Master, you have to know the law. Confer with the past masters of your lodge and ask their advice on your plan for the year. Get their buy-in early on your programs you want to have. That way, when they object to something, you can ask them why there is a problem now when it was just fine before. Also, you will be getting expert advice from people who want to help guide you around pitfalls. Meet with your expected line officers and get their input and buy-in on your calendar and plans for the year. Make a five-year plan for what you expect to get done over time. This will help everyone work toward the same end, whatever it is. Lead the lodge with humility. Humility is just as important when leading as it is when following. Ask opinions, guage attitudes, and make decisions based on wise counsel. And for goodness sake, whatever you do, don’t be surprised when I admonish you about whatever tomfoolery is going on that I don’t approve of. Don’t you know that I am a past master?